I know it’s hard to read, but bear with me (I’m sure there was no intent to make it confusing). The coupon grants discounts of 10%, 20%, or 25% depending on what you buy. I intended to buy a man’s wallet. The discount would be 25% if it was a “single regular, sale or clearance fashion item for the entire family including accessories, plus selections for your home.” The discount would be 20% if I’m buying a “sale & clearance and select regular priced women’s [sic], men’s [sic] and kids’ apparel and accessories, fine and fashion jewelry, frames, bed & bath items, housewares, luggage, and china.” The 10% discount appears to apply only for “all sale & clearance and select regular-priced furniture, mattresses, area rugs, electrics and electronics.” Any idea where my wallet fits? Me neither. I walked into the store and found the mens’ wallet display. There were three tables: one table announced that everything on the table is on sale for 20% off. The second table had a sign that all wallets there were 30% off. The third table had a sign that was covered up. You make the call. As you might expect, my first question was whether I could combine the two discounts: the sale price on the wallet and the coupon. I found a suitable wallet (manufactured by Geoffrey Beane if that matters to you). The list price was $36, the upper level of what I wanted to pay. But wait: it’s on the 30% off table and I have a coupon for either 20% or 25%. How much is the wallet now? Good question. 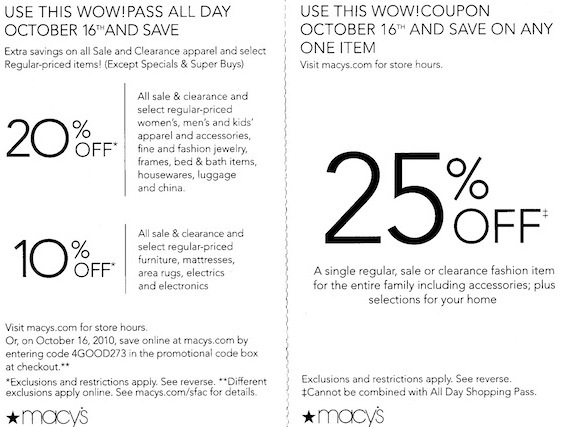 The first salesperson I asked read the coupon and said that I have to have a Macy’s credit card to use the coupon. I asked where he sees that on the coupon and he called another salesperson over. This person seemed to think I could combine the two, but he wasn’t sure (that’s what the cash register was for). We walked over to the cash register and he suggested that I apply for a Macy’s credit card which would give me an additional 25% off of this purchase. That would have been fun, but I declined. At this point I’m still not sure what I’m going to pay. OK, drum roll: the 2nd salesperson rang me up and the total price was $21.92. I can’t complain, and I bought the wallet. Now, here’s the question: how did it go from $36 to $21.92? I started writing the Money Chronicles because of experiences like this. We’re often bombarded by offers of discounts and sales, and more often than not we have no idea how much we’re going to pay. The 30% off table looked enticing, and being able to save an additional 10%, 20%, or 25% sounded even better. But neither I nor the cashier knew how much I would be charged until the cash register told us. One thing I knew right away was that I wouldn’t get 55% off (30% plus 25%). But let’s start with the 30%. The list price of the wallet was $36.00 and 30% of that is $10.80. Subtract the $10.80 and the wallet should be $25.20. So far so good. Now for the second part: it appears that my wallet is catagorized as “sale & clearance and select regular priced women’s [sic], men’s [sic] and kids’ apparel and accessories, fine and fashion jewelry, frames, bed & bath items, housewares, luggage, and china” as I was given the 20% discount. I guess the wallet is an accessory. Too bad it doesn’t qualify as “for the entire family” as I would have gotten 25% off. In any case, I got 20% off the $25.20. That’s $5.04, bringing the total down to $20.16. Add the 8.75% sales tax of $1.76 and it brings the total to $21.92. In the end, I was discounted $14.08, which was 39%. But I wonder how many people would have thought I’d have gotten 50% off (30% plus 20%). 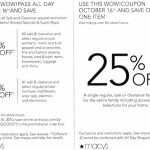 Each discount made the next one less valuable, and I have to wonder this: if I had applied for a Macy’s credit card, where would that discount have come? I’m guessing it would have been after the 30% and before the 20%. That being the case, it would have gone like this: Start with $36.00, minus the 30% ($25.20). Now take the credit card 25% ($6.30) and that gets me down to $18.90. Now the 20% coupon gives me another $3.78 off, bringing the total down to $15.12. Add on sales tax and we’re back up to $16.44. It gives me a new credit card with (likely) a high interest rate, and it would have saved me $5.48. Doing the math makes it seem less valuable. The Justice Chronicles, Volume 4: Are We Ready To Go Backwards In Our Compassion? This image may be a strange way to start a blog on justice, but bear with me. 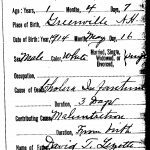 This is the death certificate of Joseph Arthur Calixte Lizotte in Greenfield, New Hampshire. For the record he’s my 7th cousin twice removed, though I doubt I would have ever met or heard of him had he lived. The death certificate is hard to read, but he died in 1915 at 16 months of cholera (that he had for 3 days) and malnutrition (that he had for his entire life). I came across this death certificate about 10 years ago when I was doing genealogy research and was struck and saddened by the fact that someone could die (at least partly) from malnutrition here in the United States. Simply put, the programs that would have saved him wouldn’t exist until 20 years later when the country was in the middle of a depression. As I look over the political landscape today I worry that we may be headed back to those days. The Great Depression lasted only a decade but framed much of the 20th Century. Talk to nearly anyone who lived through those years and he will tell you that it was when people came together to help each other. It was also a time when our nation began to reflect on common values. Led by President Franklin Roosevelt (1882-1945) we developed programs to support the elderly (Social Security), the poor (Welfare, later known as Aid to Families with Dependent Children), and the unemployed (Works Progress Administration, Civilian Conservation Corps, and others). In later years help was expanded to include the hungry (Food Stamps). By the 1960s we began to provide health care to the elderly and the poor (Medicare and Medicaid). Though far from complete, these programs ensured that most of the basic needs of most of us are provided. If my distant cousin had been born in 1934 instead of 1914 he likely would not have spent his entire life suffering from malnutrition. Because of progress made in plumbing and cleanliness he probably wouldn’t have even developed cholera, but if he did he would have had an 80% chance of surviving it (see the CDC for more information). All these programs were funded through the taxes we paid, and we paid them because they reflected our values. Fast forward to today. I’m not sure we still share those values; as I read the political landscape, the only real value I see is that I should not be inconvenienced or charged for anything that will benefit anyone other than me. If you’re running for office, the fastest road to defeat lies in not promising to cut taxes. It’s become fashionable to claim that government does too much and is too costly. Meanwhile, on ground level, our schools, fire departments, libraries and infrastructure are crumbling. We are laying off teachers while school attendance continues to rise. We’re also making it harder to access services. In 2008 here in San Diego, only 29% of those eligible for food stamps actually received them. Why not? These answers are always complicated but I don’t think anyone can deny that the process of applying is difficult and humiliating. Fortunately there has been some publicity around this and more hungry people are accessing food stamps, but the number is still too low. This will ensure I can never run for office on any level, but I think we need to be willing to pay for what we value and be frank that we are all invested in good schools and full stomachs. We, as a whole, need to be compassionate not just with our minds but also with our wallets. We need to live in a society where nobody dies (even in part) of malnutrition.